Or is it – where there’s hope there’s life? At last some good news. Today, exactly 5 months after returning from France, we were visited by a doctor, a nurse and a technician, and it seems that before long (10 days was mooted but we shall see) Clive will have not only equipment to help him walk again but also manpower at home for a short time, which latter is quite unheard of in Italy. Adding even more pigment to our Red Letter Day, he unexpectedly stood up, something which he managed a few times about a week ago but had been unable to do since. It took even him by surprise and it happened in front of all those people!! The technician got quite excited. So here’s to new life, and to represent it is a photo of my baby wisteria, grown from seed and now spreading out little leaves. 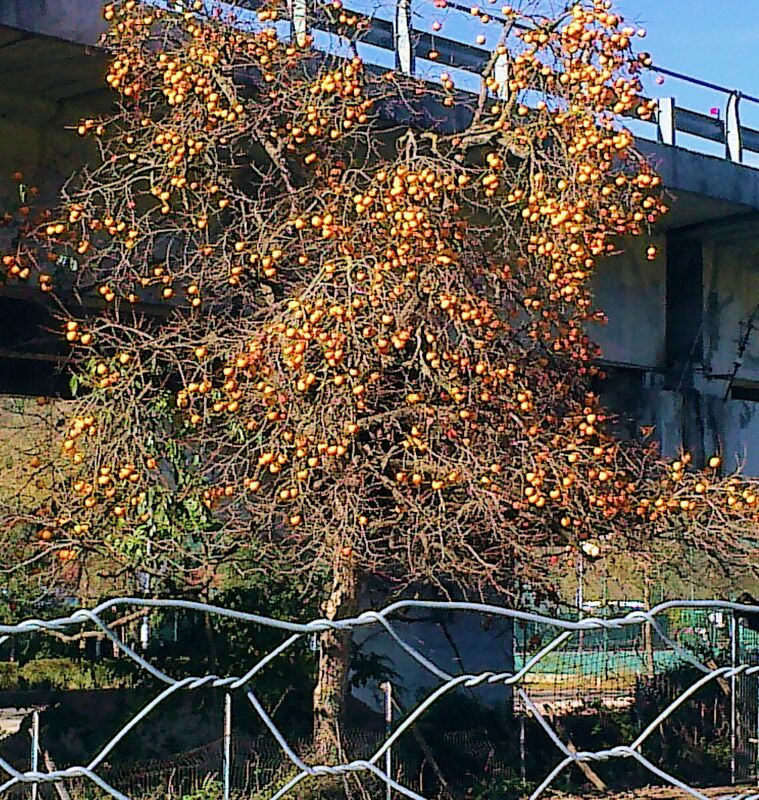 The photo shows a laden persimmon tree under a road bridge. I took it today with my phone so the quality isn’t fantastic, but the point is the contrast between the golden fruit and the various un-aesthetic structures and barriers around it. I’m feeling a similar contrast at the moment. There’s on the one hand the physical beauty of where we live, the tranquillity, the security, and on the other hand the excessive bureaucracy. A case in point. I phoned this afternoon to ask if Clive could change from two-piece colostomy bags to one-piece, both of which types he’s used in France. Bear in mind that a tight – cruelly tight – rein is kept on quantities issued in Italy. Pier, crash barrier, shack, gate, wire fencing – the persimmon tree’s surroundings don’t come close! No, this doesn’t represent a new vice; it’s what saved the day last night. I was reclining on the sofa watching television, tried to get up, and found that my back wouldn’t let me. Each time I tried it got worse until I couldn’t move at all. I was just stranded there clinging to the sofa cushions for dear life. At Clive’s insistence, I called the Guardia Medica, who is the out-of-hours stand-in for the doctors of a given region. I was afraid the man I spoke to wouldn’t find our house, especially in the night, but he did. He was a charming individual – calm, sympathetic, and interested in both of us. His English wasn’t bad either. He gave me an injection then waited to make sure it had worked enough for me to get on my feet. I wish I’d asked his name, just in case, for the future, but I didn’t! At 1:00 am the Croce Bianca (White Cross) arrived to pick us up in what they call a ‘pullman’ – the Italian word for coach, but it’s in fact a sort of minibus. This transport is provided to patients who are being treated under the Italian Health System (in our case through Clive’s E112) who would have difficulty going by other means. We drove through the night, drowsing uneasily, and by the time morning came we were in the mountains. By lunchtime we’d reached Sankt Blasien which is where the clinic is – an attractive town, very neat and clean. It was obvious it had snowed a lot; there were great heaps where it had been cleared back. I later heard they’d had 60 cm. Clive was examined straight away by a doctor, and I stayed on well into the evening. The evening meal was served at the unhelpfully early hour of 5:30 pm. The patients arrived in dribs and drabs from all directions, up the stairs and down the stairs, limping and staggering. It reminded us so much of a scene from ‘The Walking Dead’ that we got the giggles. The hotel was a breeze to find – for everyone except me. It was very dark and the streets were practically deserted. Fortunately I came across a charming lad sweeping snow in front of his house. He spoke very good English (he told me he was top of his class) and he conducted me via a shortcut right to the door of the hotel. This morning we managed to change doctors in Valtopina ASL, quite painlessly, and went to the surgery in Vescia for a second time. The timing was perfect in one sense because late last night Clive discovered a lump under his left arm. He was able to get the doctor to examine it and she confirmed his fears that the lymph node was swollen. She prescribed a strong antibiotic and a special cream, and told us to come back in a week’s time to see if it has reduced in size. She also took names and phone numbers of the various characters involved in the lymphedema treatment and E112 saga, saying that she will phone them when she has a moment. We’re very worried about the swollen lymph node because it can spell all kinds of trouble, but at least we don’t feel quite so alone any more. Valtopina ASL (Health and Health Administration Centre) is open one morning a week – Thursday – so, after phoning to verify they could help, I went down there today to change doctors. The clerk behind the hatch greeted me with the stony-faced ‘it isn’t my fault’ look of the Italian bureaucrat and announced that the computer wasn’t working. “But I phoned first!” I protested. So that was that. Complete lemon. 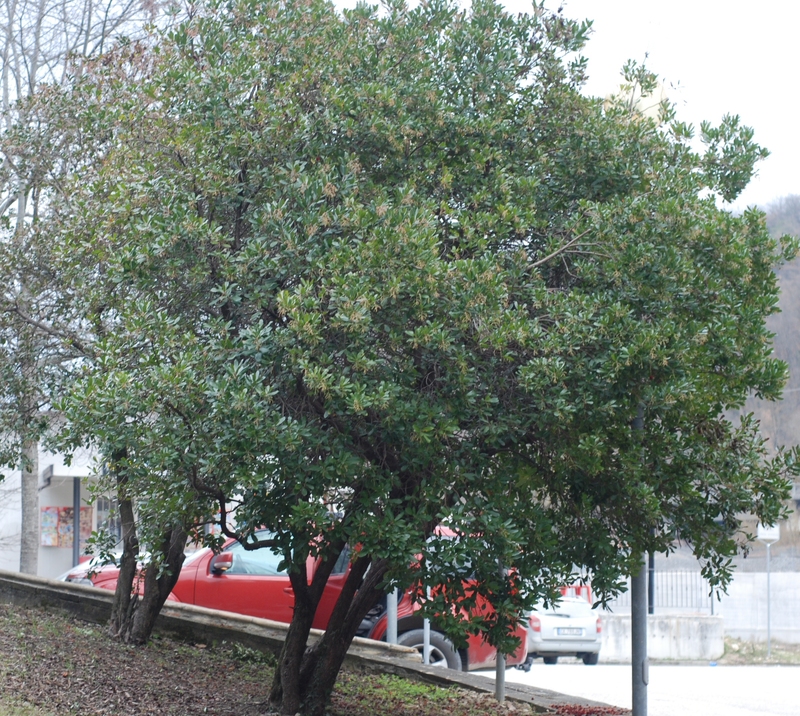 But there are 4 mature and beautiful strawberry trees just outside the entrance. I spent a few enjoyable minutes taking photos of them. We’ve found a doctor who can’t fail to be an improvement on our last one and also the one that was recommended to us. Unlike Britain, where doctors operate in Practices and there’s a danger of running into the one you’ve just moved from unless you change Practice as well, in Italy doctors are separate entities. Sometimes they club together and share relatively modern and well-appointed premises, but usually the surgery (‘ambulatorio’) is in some nook or corner of an old building in the historic centre. Access is often up difficult stairs or across pedestrian-only cobbled courtyards, and there are no signs to guide you on your first visit. You have to ask a passerby, who almost invariably will ‘know’. 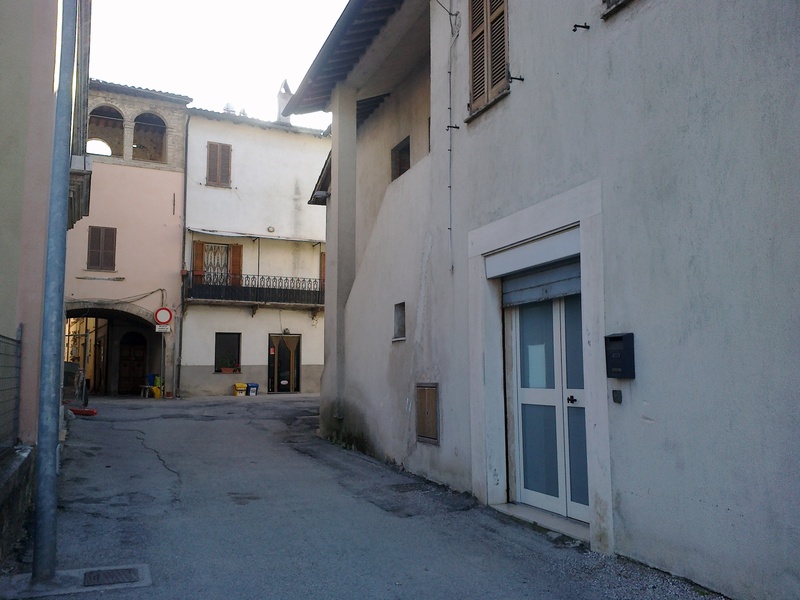 This new doctor has 2 surgeries, one in Foligno and the other in Vescia. Vescia is the nearest. We went to see her yesterday evening, for a pilot visit before we make the official change. There’s no appointment system in Italy: you just turn up within surgery hours – or an hour before if you fancy a gossip – and it’s first come, first served. It was freezing cold: the heating wasn’t working, she explained from the depths of her fur coat. As a woman, I do generally prefer a female doctor, and Clive isn’t bothered either way. Vescia was the nearest possibility. So far I feel very optimistic; she’s already inspired me with confidence.